MK Azoulay tells Reform, Conservative to build their own Western Wall in the US, says Western Wall plan caused earthquakes. 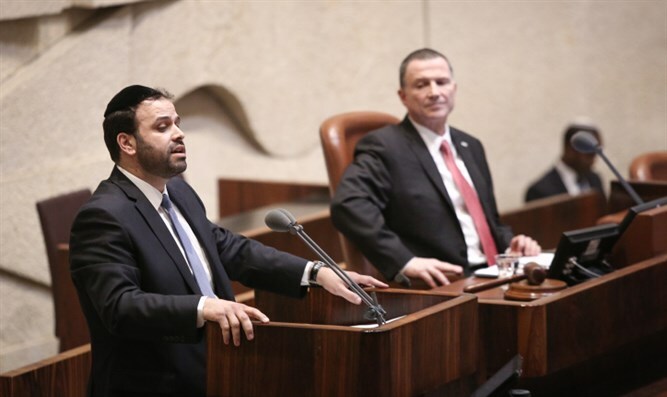 A haredi MK during a Wednesday Knesset discussion on the Western Wall plan to expand the southern plaza blamed Israel's recent earthquakes on the proposed agreement. On Wednesday morning, Israel suffered an earthquake measuring 4.1 on the Richter scale. On Wednesday evening, an additional earthquake believed to measure 4.3 struck northern Israel, near where the first quake had struck. During the discussion, Shas MK Yinon Azoulay said, "Today we heard that there was an earthquake. Maybe we should do some soul-searching? Maybe this earthquake is because someone here is trying to harm what is holy to us?" "Listen to our pain. They're not Jewish. Would you give them a foothold in Al-Aqsa Mosque? "The Prime Minister, who [news anchor] Dan Caner said was the first to identify the Carmel disaster - when it comes to the Western Wall disaster, with the Women of the Fight, with the Reform - why does he not know how to identify it? "What do you have with the antiquities of the Western Wall's stones? I have a suggestion for you, take the money that you invest in the State of Israel, and build yourselves a Western Wall in the United States." The Carmel disaster was a forest fire which raged on Mount Carmel for three days in December 2010. It is believed that the fire started due to human negligence. The blaze claimed 44 lives and scorched over 50,000 dunams (12,000 acres) of land and forest. "Women of the Fight" is a reference to the sometimes-violent Women of the Wall movement, whose members have insisted on disobeying orders, thereby disrupting worshipers at the Western Wall. Joining the discussion, United Torah Judaism (UTJ) MK Moshe Gafni said, "There is one place where the entire Jewish nation goes - and that is what we are used to for years already. Even when we were in exile, even when we weren't in Israel, we always looked towards the Western Wall, the holy wall, the only remnant of our Holy Temple, which was destroyed." "We are now in the period of the Three Weeks, when we mourn the fact that the city was breached...and this is how we approach the Ninth of Av (when the Temple was burned - ed.). We pray to G-d that the Ninth of Av will be canceled, that Moshiach (the Messiah - ed.) will come, and that the Temple will be built. But this is the place where everyone goes, this is where everyone faces when they pray, even when we were in far-off lands, even when we were in exile. "Now the Reform and Conservatives come. They want to pour out their hearts at the Western Wall, just like everyone else. But this group comes and says: I'm going to disturb the prayers, I'm going to do other things, things which hurt and harm our hearts. I'm not talking about the details, I'm against the details. But why, why? Why are you doing this to us? We are the Jewish nation. Even those who don't live here, pray for the Western Wall. We definitely pray for the Temple...three times a day. We want to come to the Western Wall - why are you disturbing us? Are we disturbing you?"